The Pine Ridge Oglala Lakota [Sioux] Reservation in South Dakota is among the poorest of all American Indian Reservations. Roughly the size of the State of Connecticut, its 11,000 square miles are home to about 35,000 people with an average annual income of less than $4,000, an 80-85% unemployment rate, and an estimated life expectancy of 45-48 years old. There are no libraries on the Reservation beyond small, limited school libraries in the mostly-underfunded schools while Rapid City, the closest town of any size, is 120 miles away. With conditions such as these, there is little disposable income for luxuries such as books for children. Yet books are often the “stuff” out of which dreams are made. Dreams are critically important. Unquestionably, it is the dreams of children which will create the future of our world. Twelve years ago, a non-profit organization, Pathways to Spirit <www.pathwaystospirit.org>, was founded by Carmeen and Franklin Klausner and Jan McBroom in Fort Collins, Colorado. It was created after they had visited the Pine Ridge Reservation in 1996 and saw for themselves the staggering conditions that existed there. Over the years, they and their volunteers have tried to assist the Lakota People by filling practical and urgent needs such as used mobile homes, sewing machines, furniture, large and small appliances, utility assistance, a small scholarship program, and other basic items. All things desperately needed on Pine Ridge. Yet, despite their focus on basic needs, Carmeen Klausner, President and Executive Director of Pathways to Spirit, nurtured a personal dream for six years. 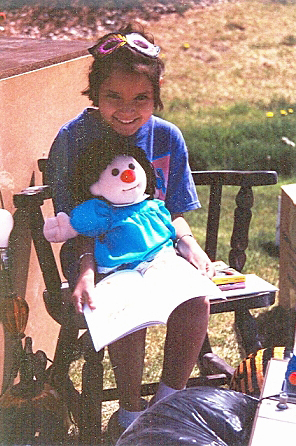 Her hope was for the organization to build a community children’s library on the Reservation. Despite not having enough funds to buy land or a building, she steadily collected children’s books. It was her dream, and her prayer, and she refused to give up. 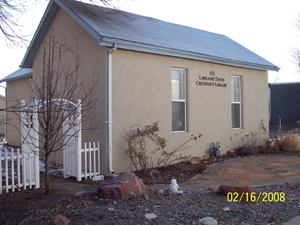 Then, in 2007, Ms. Klausner was contacted by Annette Francke, the woman who had founded the Lorraine David Children’s Library eleven years ago in Erie, Colorado. That library had been a long-time dream of Ms. Francke and she and other Erie women had worked hard over the years to help it grow. Now their library was moving to a new facility and the Board of Directors was willing to donate the entire contents of their old library to the Pathways to Spirit community children’s library project. However, there was one stipulation to this generous donation valued at $40,000: Pathways to Spirit must have a building on the Reservation for the library contents at the time of the actual donation in February, 2008; no storage allowed. Meanwhile, also in 2007, Carolyn Tail and her husband, Eli Tail, a respected Elder and Lakota Head Man, gave life to their own dream: an alternative school in the community of Porcupine on the Pine Ridge Reservation. Housed in an old, unused building donated by the Tribe, the school focuses on traditional language and culture as well as vocational, academics and life skills, critical thinking, and the love of learning. The Cokan Tiospaye Owayawa <www.cokantiospaye.com> provides an ever-expanding, nurturing learning environment which benefits both the children and their communities. Synchronistically, on a recent trip to the Reservation, Carmeen Klausner mentioned to Carolyn Tail that she was in critical need of a building to house the children’s library. As coincidence would have it, the Cokan Tiospaye Owayawa had an empty section of their school building more than large enough to house the entire library. It was the perfect solution. Housed in a school and located a mere block away from the public elementary school, the Porcupine Children’s Library had a home at last. As Carolyn Tail inspected and mapped out the area of the building for the library, a young boy about 10 years old came up to her and wanted to know what was going to happen. Explaining about the children’s library, his sole response was simply an incredulous question….. “For reals????" "Really, for reals?? ?” In shock and amazement, over and over the question came from him as he followed her around. Obviously the library represented a dream for him as well. 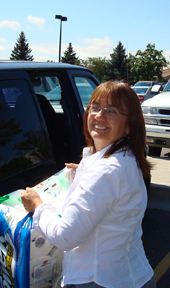 On February 16, 2008, Pat Bundy, the current President of the Erie Children’s Library, and her library volunteers worked hand-in-hand with the volunteers from Pathways to Spirit to load the entire contents of the Erie library onto the Pathways’ semi-truck. Along with 3700 books would come 5 computers and other electronic equipment, child-sized tables and chairs, librarian’s desk, card catalogs, bar code equipment, shelving, even decorations. Pat Bundy (second from right, bottom row), President of the Lorraine David Children's Library and her library volunteers gathered with the volunteers from Pathways to Spirit for loading day. 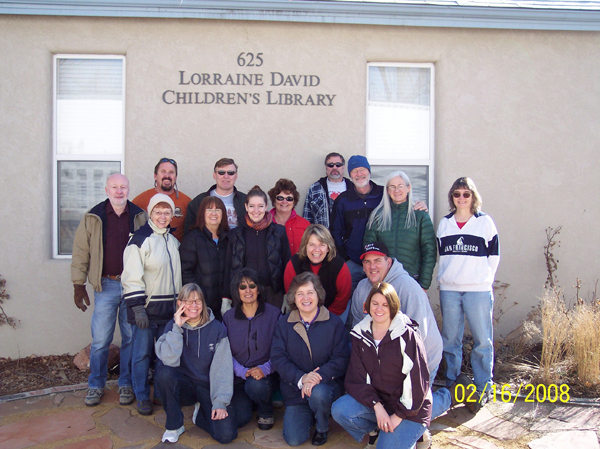 On March 16, 2008, volunteers from Pathways to Spirit will head to the Pine Ridge Reservation to set up the library. Before they install the contents, there are needs that must be addressed, such as framing and building walls and doors, purchasing and installing carpeting ($450 alone) for the 25’x19’ concrete floor, installing locks and lighting, and performing minor electrical repair. The renovations will be overseen by volunteer Colorado contractor Paul Thew, supplies paid for by monetary donations. The work will allow the library to be separate from the school itself so that it can be open to the community. The Porcupine Children’s Library will require several days and the efforts of many volunteers from both Colorado and Pine Ridge in order to be complete. Fortunately, several librarian volunteers have also agreed to go to Pine Ridge and train three local people how to administer this community library, hold story-telling hours, etc. Carmeen Klausner relates that they still need help and are also seeking donated bean bag chairs, over-sized stuffed animals, and, most especially, more Native American books for children and youth. Amidst the painting, carpeting, the shelving of books, and the excitement, there remains one indisputable fact to this story: dreams come true. Even more, in helping others, one person’s dream can often enable another person’s dream. There is no question that there are only winners when children are given hope and help to dream their own dreams. As has been noted, the dreams of children will be our future. Now, the dreams from two States and three organizations have united to help the Lakota children in the Porcupine District of Pine Ridge have a safe place to read and hope and dream more of their own beautiful dreams. Ultimately, the world is a better place for that.